Due to the sins of their people, both Daniel and Nehemiah found themselves in exile from the Promised Land. While there, they exemplified the need for individual and corporate repentance. They did this because they knew what was required of God before their people could return back to the land. Such repentance illustrates the biblical principle God requires before anyone can dwell again with His blessings in the Promised Land. In Daniel 9:1-19 we see this great prophet seeking God through “prayer, supplications, fasting, sackcloth, and ashes.” Daniel was doing this because he knew that the prophesied exile from the land was about to end, and if his people were to return, certain things had to first happen. During his prayer, Daniel admitted the sin and wickedness his people committed against the Lord. Daniel summarized the origin of the problem and why it happened when he said, “Yea, all Israel have transgressed thy law, even by departing, that they might not obey thy voice; therefore the curse is poured upon us, and the oath that is written in the law of Moses the servant of God, because we have sinned against him” (Dan 9:11). This is the curse Moses said would come on the Promised Land and on those who dwelt there due to their rebellion against the Lord. And why did Daniel say this exile happened? Because of his people’s sinning against their land’s owner – God! Daniel went on to tell the main purpose of it all. “As it is written in the law of Moses, all this evil is come upon us: yet made we not our prayer before the LORD our God, that we might turn from our iniquities, and understand thy truth.” God sent this judgment because of their refusal to repent and do the biblically correct things as commanded. This brought them blindness to God’s truth. This is exactly what happened during Jesus’ time. Jesus’ message was repentance; yet many in His day did not heed His warning. Such rebellion caused them to be unable to see that their Lord was in their midst. Speaking on this problem, John recorded: “And Jesus said, For judgment I am come into this world, that they which see not might see; and that they which see might be made blind. And some of the Pharisees which were with him heard these words and said unto him, Are we blind also? Jesus said unto them, If ye were blind, ye should have no sin: but now ye say, We see; therefore your sin remaineth” (John 9:39-41). This wasn’t a physical blindness, but a spiritual one that disabled a man from looking inward thus seeing his own sin. Nehemiah 1:4-11 also took place during a time when the Israelites were in exile. Nehemiah indicated that the eviction from the land happened because “both I and my father’s house have sinned.” He further said, “We have dealt very corruptly against thee, and have not kept the commandments, nor the statutes, nor the judgments, which thou commandedst thy servant Moses.” He said this was what Moses had commanded. They knew this included the rebellious being scatted among the nations. The Bible records Nehemiah prayed day and night in repentance for his people’s sins. His focus was to admit the wrongs the people committed, because he knew God promised: “If ye turn unto me, and keep my commandments, and do them; though there were of you cast out unto the uttermost part of the heaven, yet will I gather them from thence, and will bring them unto the place that I have chosen to set my name there.” Nehemiah shows us that repentance (turning) as well as “keeping” and “doing” the landowner’s stipulations are biblical requirements before any people can return back to the Promised Land with God’s blessing. These men of faith show us that before God can bring a remnant back into the physical Promised Land, He must follow His own written conditions as outlined in Deuteronomy 30:1-5. In 70 AD, the Jews were exiled from the land and their Temple was destroyed. This judgment came because of their rejection of both Jesus being their Savior and His New Covenant being the message of the Kingdom of God (see Luk 19:41-44). Repentance then, according to the terms of Deuteronomy 30, would require them to both accept Jesus as their Messiah and to obey His New Covenant for their salvation. When we look at the account of the 1948 return, nowhere do we find either of these happening. So because the aliyah (Jewish immigration to Israel) in 1948 had no such biblically mandated evidence, then to teach that God has blessed that time with some kind of prophetic significance is without biblical substantiation. (17) Therefore say, Thus saith the Lord GOD; I will even gather you from the people, and assemble you out of the countries where ye have been scattered, and I will give you the land of Israel. (18) And they shall come thither, and they shall take away all the detestable things thereof and all the abominations thereof from thence. (21) But as for them whose heart walketh after the heart of their detestable things and their abominations, I will recompense their way upon their own heads, saith the Lord GOD. Ezekiel references the New Covenant in this prophecy, since it is only because of Jesus that a new heart and a new spirit are made available. Like all the other writers of the Bible, Ezekiel confirms that only those obedient to God are His true people since they are the ones who make Him their God. These New Covenant blessings are what the writer of Hebrews references when writing: “For finding fault with them, he saith, Behold, the days come, saith the Lord, when I will make a new covenant with the house of Israel and with the house of Judah: Not according to the covenant that I made with their fathers in the day when I took them by the hand to lead them out of the land of Egypt; because they continued not in my covenant, and I regarded them not, saith the Lord. For this is the covenant that I will make with the house of Israel after those days, saith the Lord; I will put my laws into their mind, and write them in their hearts: and I will be to them a God, and they shall be to me a people” (Heb 8:8-10). These essential obligations of repentance from sins and obedience to God’s Word are required before rightly fulfilling any biblical condition of return, whether in 1948 or any other date before or thereafter. Not one time does the Bible show the blessing of dwelling in this land being promised outside of obedience and faithfulness to God. Never in the accounts of Israel do we see them having a biblical promise of occupancy in this land even though they remained in rebellion against the landowner’s rules. Furthermore, since the Bible does not change or lie, these same precedents would be applicable for our time as well. In the opening of this second part I spoke of a landowner who took the doors off a house thus exposing its interior troubles. After these doors were removed, his rebellious tenants no longer could continue living there in security. God did the same throughout the history of His physical land as well. He would periodically remove the security He placed over that land so those living in rebellion against Him would leave. God never wanted them to stay away. He always hoped their absence would make their heart grow fonder of Him so that one day they would return to Him in repentance and obedience. In the 70 AD judgment, Jesus once and forever removed the security He had placed over this physical land and its Jewish inhabitants. This does not mean that no one living during that time could be saved from this judgment. What it did mean was if a person (Jew, Samaritan, or Gentile) that is in rebellion against Jesus and His Word will repent and be born again in Jesus’ Name, they would receive the blessings of the Lord’s promise. Jesus is the One through whom we find our security and promise. Jesus said, “I am the door: by me if any man enter in, he shall be saved, and shall go in and out, and find pasture” (John 10:9). 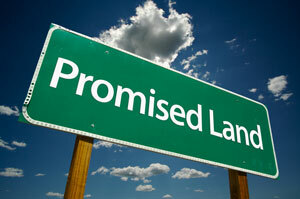 Jesus is and always was the only way into the true Promised Kingdom of God! This will forever be true since Jesus is the One True God, who is both Lord over all lands, and King over all men. In parts three through six of this study, we saw that the Bible nowhere promised any man or woman or group of people exemption from judgment for living in rebellion against God. Because of their rebellion, the Children of Israel were evicted from the physical Promised Land. The Bible shows the only way to return was by repenting of their sins and afterward living a life devoted to God. In the final three parts of this study, we will look at how the “Promised Land” is defined in the New Covenant of Jesus Christ, and who the Bible says is to now dwell there.